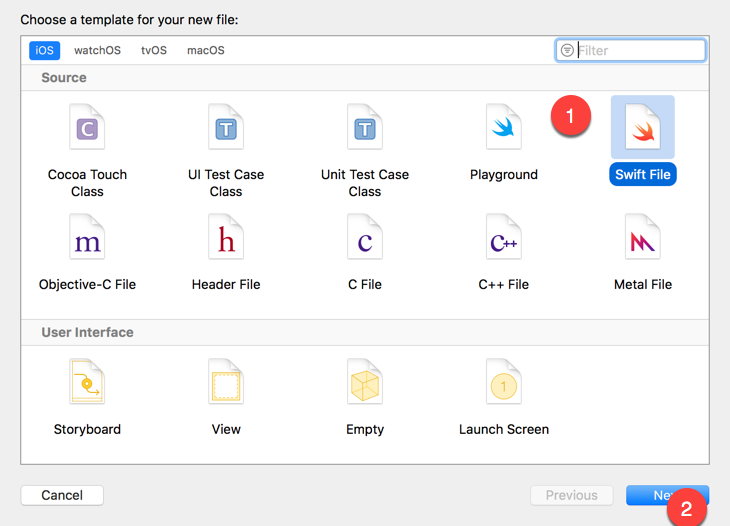 The series blogs will be a full introduction of Fiori for iOS controls . It helps you to get best benefits of controls provided by SAP to develop iOS apps using swift language. 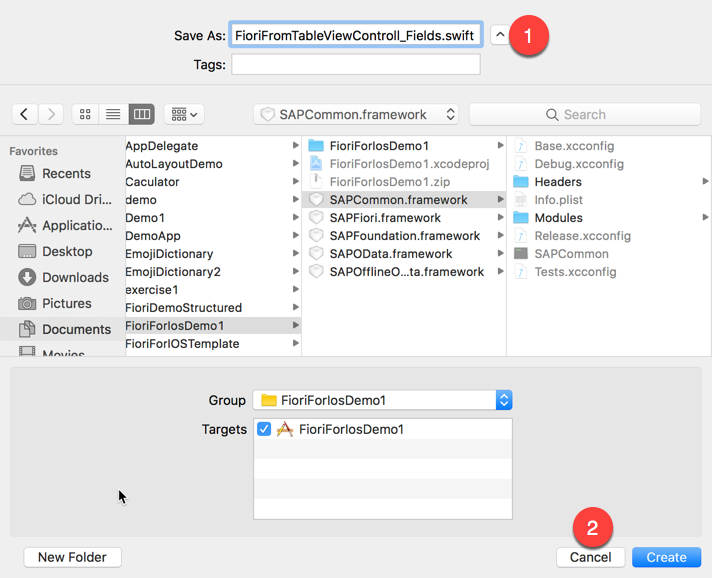 In my previous blog, you’ve got the ability to build a complex input form using Fiori for iOS. After you have done it, you may find the class is getting bigger and the code is not easy to maintain. In this blog I will try to make this class more reusable, then you can use it as a pattern for build complex input form. To start this tutorial, I assume you have finished the project in my previous blog, and this would be the start point of it. Before we start to modify our project, I will explain my idea of how to make the code reusable. Discussion of How to Optimize the Code. A big class or several classes? As you class get bigger, you may want to separate your class to several classes. 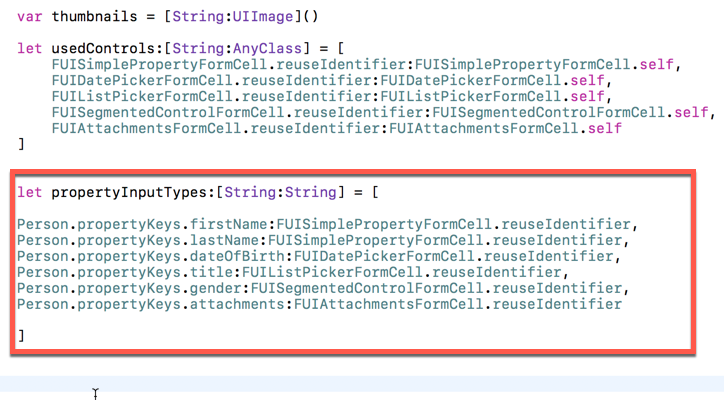 For example, you can create a single class to handle the call backs of the attachment control. But cut one big class to several classes will make your program more complex. In swift, there is a concept called extension, which can help you to split your class to several files. 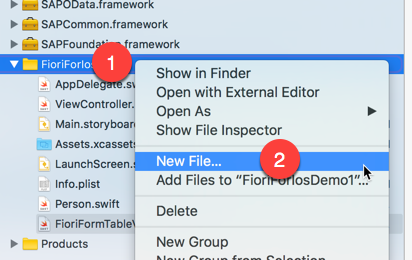 To make my code more clear, I will split my FioriFormTableViewController.swift into 4 files. 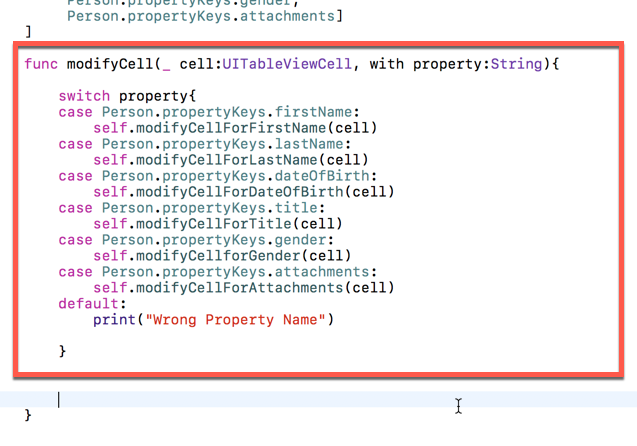 FioriFormTableViewController.swift is the main part of the class, I do declaration of attributes in this file( you can only declare attributes in this file!). I will declare attributes not only save thumbnails of images but also save some configuration data to make my program reusable. Methods which relative to form configuration is also in this file. 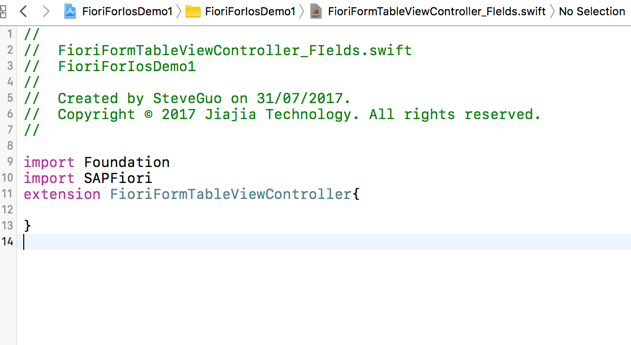 FioriFormTableViewController_Fields.swift contains methods for each field, I will create methods for each of those fields. This can avoid you put code of cells in the long “switch… case” statement. FioriFormTableViewController_TableView.swift contains delegate methods to feed data to the table view. 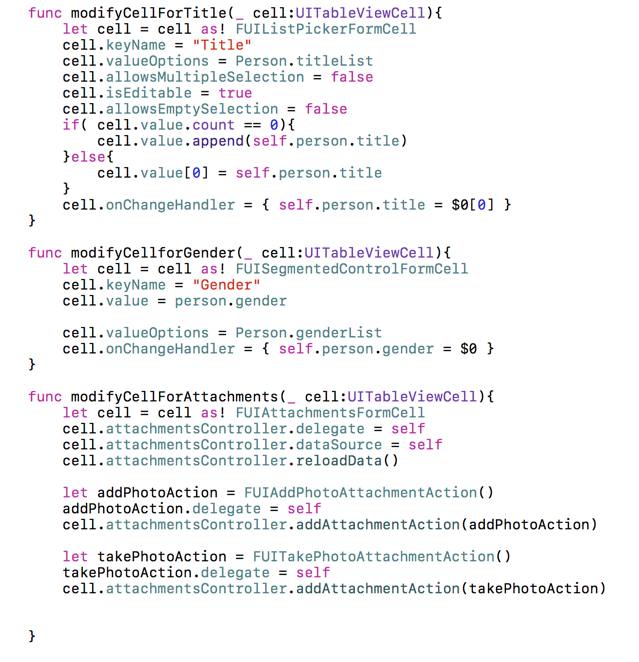 FioriFormTableViewControler_Attachment.swift contains delegate methods for attachement control, because this control is more complex than others. In the example, we’ve registered controls one by one in the viewDidLoad method, the first thing I want to optimize my code is to create a dictionary variable to store which controls I’used and initialize them by loop the dictionary variable. Optimize the code of returning the cell. tableView(_ tableView: UITableView, numberOfRowsInSection section: Int). That means you should generate your cell according the line number, and hard code the reuse identifier of the control. That makes your code not easy to maintain. 1.In which section and row, Which property of the object should be displayed. 2.Which control is used to display a specific property. Open the project of my previous blog. Or download the template file. 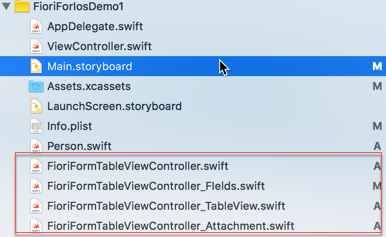 Repeat previous steps for FioriFormTableViewController_TableView.swift and FioriFormTableViewControler_Attachment.swift. Do the same thing to FioriFormTableViewController_TableView.swift and FioriFormTableViewControler_Attachment.swift. In this example, we need to store information of every property, so we need to use the name of properties. To avoid hard code, we need to create constants for every property. 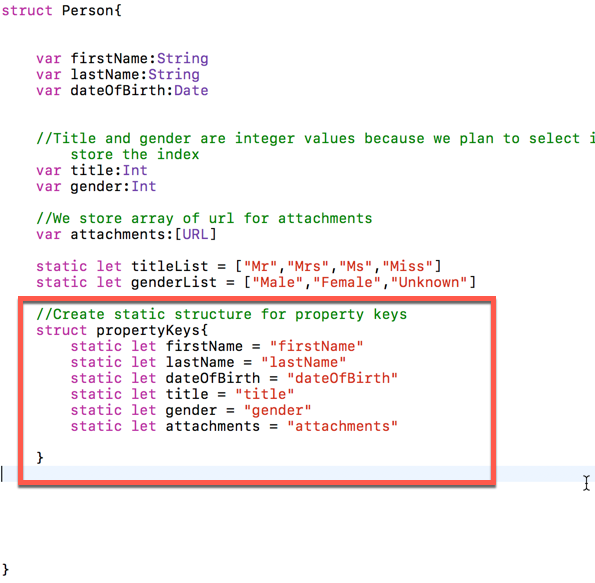 Open Person.swift and create a static structure to store property names. The dictionary’s key is string, the reuse identifier of the control, and is’s value is the class type. and change the code to register controls by look up the dictionary. 3.Create methods for each cell. Create method for every cell like following. Each method accept a UITableViewCell variable , convert it to a specific type and set the properties and call back function like we have done before. This time we write methods for each field makes your code more structure and easier to maintain. Mention the signature part of function, the . ‘_’ means the label of the parameter is omitted. That means when you invoke the method, you do not need to assign name for the parameter. You can call it using modifyCellForFirstname(<cellVariable>). And you can access the parameter using ‘cell’ in your function body. No we need to create a dictionary type to find which control will be used for a specified field. For this. we need a dictionary which store the mapping between property name and reuse identifier of the control. propertyInputTypes and assign it with values. 6.Create an array to store information of position for fields. The magic of renderer a table control is that the runtime gave us section and row, and we create the cell according the section number and row number. Now we need to create an array, which has element is also array, to store information for section and row. In the array we store the property name to help us get it’s position , or get the name by the position. For example, array means section 1, row 2. For this example, we have 1 section and 6 rows. After so much preparation, now we start to modify code for the table view and it’s data source. Before we change the code, let’s think about how to use those configuration data to make our code better. a.The section count and row count can get from the sections constant. dAnd we need one more method to help us call methods for each field according to property name. Then we start to modify those methods. The number of rows of particular section can be fetched by self.sections[<section_number>] since self.sections is a tow dimension array. Before we modify the tableView(_ tableView: UITableView, cellForRowAt indexPath: IndexPath) -> UITableViewCell method. We need to create a new method , which can call methods for each field we created in step 3. And the router method will be called when the runtime want to render a cell. 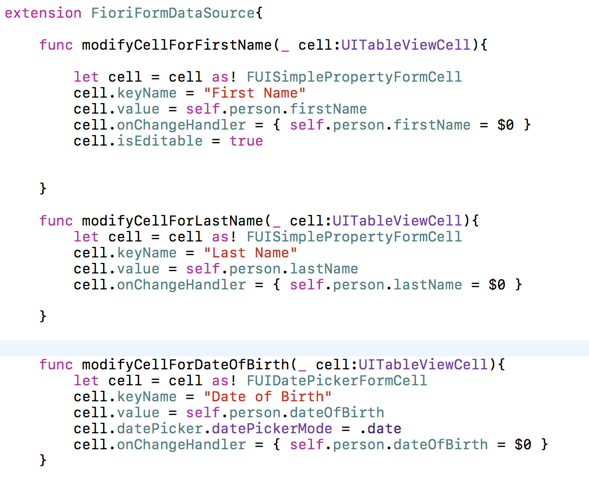 In FioriFormTableViewController.swift, create a new method called modifyCell. The function receive the cell needs to be render, and the property name of the cell, route the process to corresponding function. Now you can run and test your code! Here is the link of the source code. Please add the SDK file yourself. Here we have finished FUIFormCell series. I will add a summary for this series of controls. Then I will pick another series control to show. i hope you can keep updating.waiting for you .